Jak na to… Jak koupit a zrenovovat veterána VW Brouka a Transportera. Kniha, která poskytuje nejen technické informace, ale jak léčit Brouka a Buse, ale také historii legendárních modelů. 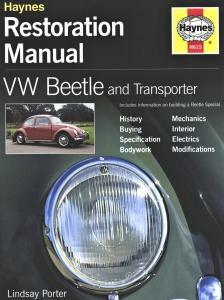 Restoration Manual VW Beetle and Transporter (English). A book that not only provides technical information about the Beetle and Bus treated but also the history of this legendary VW models. VW Beetle and Transporter can be seen as a restoration book.